The paradigm is shifting in energy production. Big power plants, which mainly work with fossil fuels, are neither attractive for the producers nor for the consumers. Instead, small-scale and distributed energy generation is becoming more relevant. This new trend has affected many industries, including decoration. 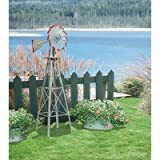 Garden windmills are a great way to decorate your garden. They are very good-looking, stylish, and unique. At the same time, they can convert valuable wind energy into electricity, which can be used for different ends. You have definitely seen huge wind turbines that are used for producing electricity from wind energy. Garden windmill basically works in the same way. As the wind passes through their blades, they rotate. By connecting the blade to a generator, this rotation can be converted into electricity. 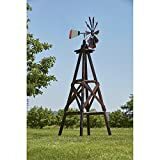 Garden windmills are the new trend in garden decoration. They are starting to become popular. The reason for their recent popularity, in addition to being beautiful, is because they are compatible with the recent hype about renewable energy. 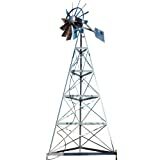 Garden windmills are produced with different material, such as nylon, polyester, metal, wood, etc. They are divided into two major types: Vertical and horizontal. Vertical windmills resemble a cylinder when they are spinning. Their blades are oriented vertically and are connected to a vertical axle. These types of windmills are mostly used for electricity production rather than decoration. Horizontal windmills are more prevalent and decorative than vertical ones. Their blades form a disc that faces the wind direction. They are similar to water-driven horizontal mills, which have been used for hundreds of years for grinding wheat into flour. 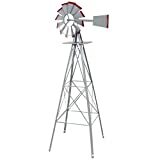 Horizontal garden windmills are produced in different shapes and colors. Whirligig windmills are the most common. They look like toy whirligigs, which children make with paper. They can have different blade numbers and lengths. Some types are miniature and can be placed on the fence, on the roof of the house, and on pretty much every part of the garden. Some other types are taller and have longer blades. They need to be placed on the ground and are able to produce a considerable amount of electricity as well. Let’s view the 10 best Horizontal tall garden windmills. Some other windmills have double functions. They also work as weather vanes, birdhouses, mailboxes, garden trellises, etc. 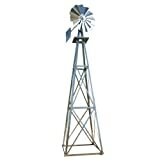 Garden windmills are produced in beautiful designs and colors. They give a unique look to your garden and make it more stylish and beautiful. In addition, considering the increasing trend of electricity prices all over the world, it is beneficial to reduce your dependence on the grid as much as possible. One of the best ways to do so is using a garden windmill. If connected to a battery set, they can produce enough electricity to power a major part of the electricity consumption in the garden. As an example, they can be used to power the lights, charge batteries of electric devices, and provide electricity for many other purposes. Using them, you won’t need your noisy and polluting generator anymore. 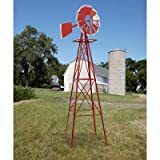 If you are looking for a beautiful decoration for your garden to give it a unique look, garden windmills are the best choice for you. They are produced in lots of shapes and styles, and you will definitely find one that suits your needs. Additionally, they can produce a considerable amount of electricity from wind energy.